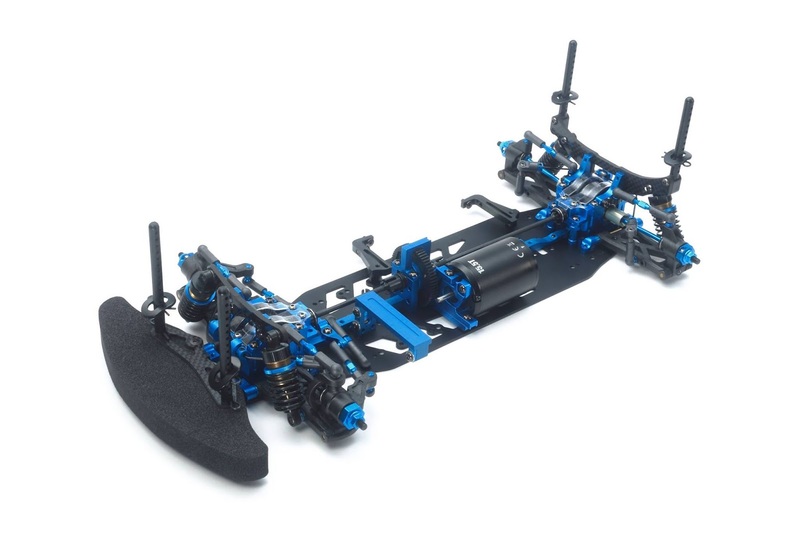 Tamiya has released a few more pictures of the exciting TB Evo 7 chassis. This time it shows us more detail on the innovative way in which you can change the chassis configurations. Let's Take a look at some of the layouts possible. Above you can see the motor is at the front of the chassis, to bring the weigh forward and installing a standard size lipo. This photo shows the motor mounted in the middle of the chassis. Also notice that you can adjust the battery mounts to fit shorty packs easily, this brings up an new range of possiblilties to balance your car. The final example here shows how you can not only move the motor to the back of the car, but you can flip it if you want. Not only can you flip the motor but you can also flip the servo mount and the battery clamps. So you have loads of configurations to play with. For example you could have the above layout and the servo back on the left with the shorty battery behind it and the esc still on the other side. The chassis is so configurable as there is no top deck. This is because of the solid spine that runs along the bottom of the 2.0mm aluminium chassis. 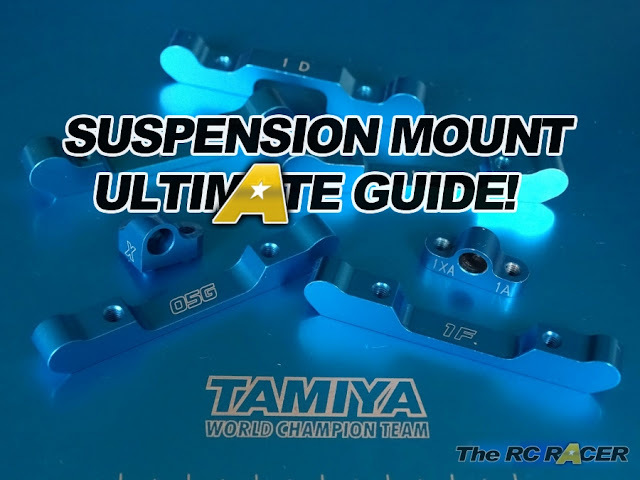 This ensures that you still have a rigid chassis but are not constrained with a top deck. The other reason why you are so free to move components around is the front steering assembly. As we spotted before this is attached to the front bulkhead. This ensures that the chassis has more space at the front near the servo. Personally I am really excited to see so many new ideas on this chassis. It shows that Tamiya are still being innovative and trying to explore new avenues with their race cars. How it performs is yet to be seen, but I am looking forward to getting my hands on one when they become available. 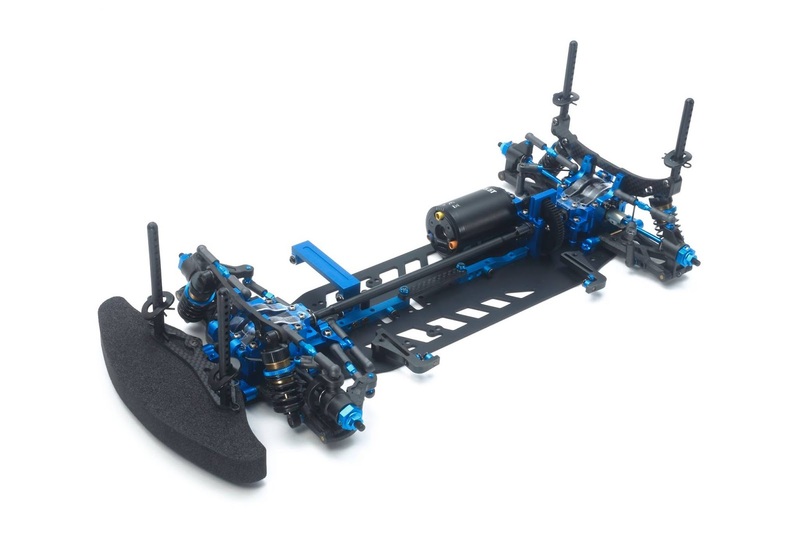 This is an R/C 1/10 scale shaft-driven 4WD chassis assembly kit. 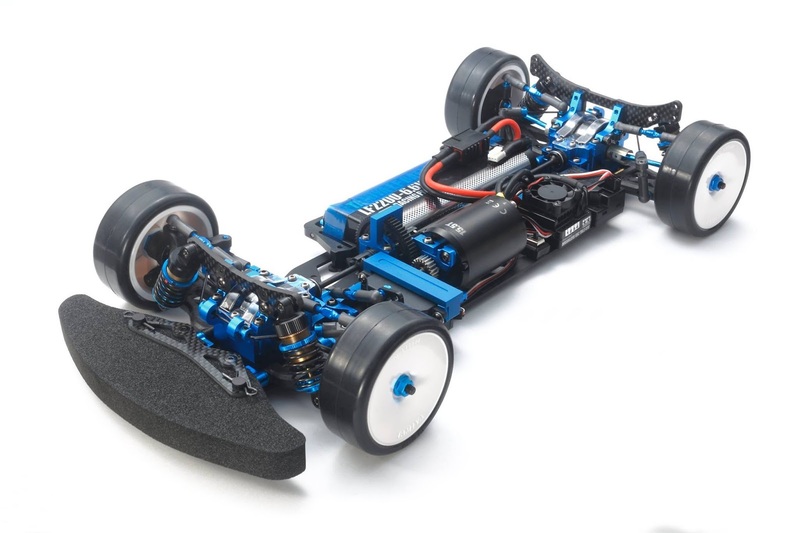 Length: 371mm, Width: 185mm, Wheelbase: 258mm. 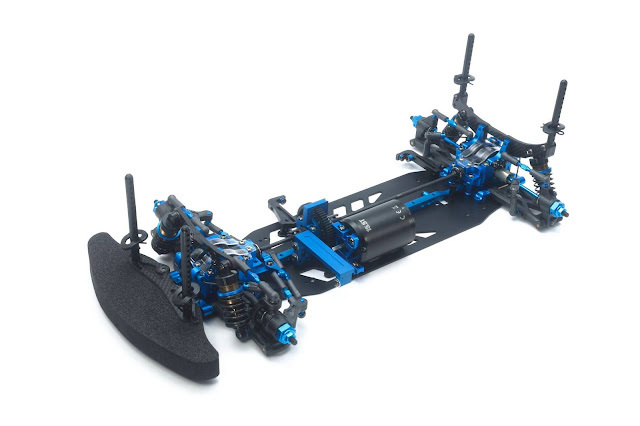 The chassis is based around a 2mm thick aluminum lower deck and 6mm thick center stiffener, which give a blend of rigid pitch damping and flexible roll. The number of screws used to attach the stiffener can be changed to alter chassis rigidity. The lack of an upper deck lowers the chassis' center of gravity. A largely overhauled layout includes updated motor positions and bulkhead design. The motor is longitudinally mounted. Users can choose from 3 layouts (front; mid; rear) to adjust performance depending upon conditions and driving style. Comes with TRF super short big bore dampers. 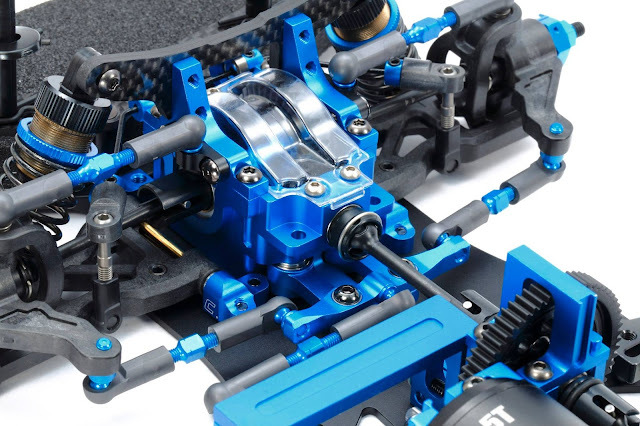 Motor clearance can be adjusted simply from above, for quick in-pit tweaks. Steering linkage components are installed directly onto the bulkhead as opposed to being attached to the chassis. This removes any effect upon chassis roll. 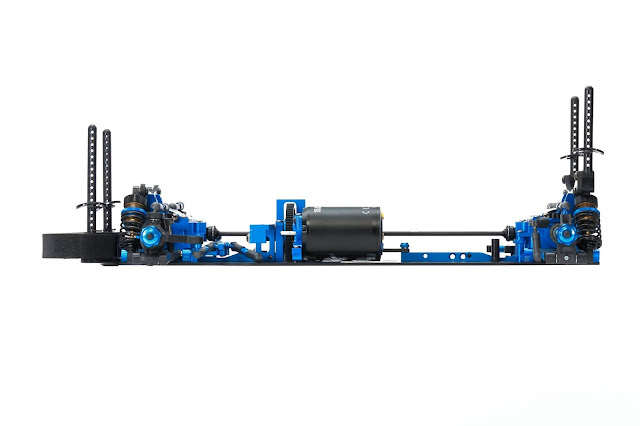 Highly-efficient shaft-driven 4WD is achieved with a front direct coupling and WO universal shafts, plus a rear gear differential unit and aluminum drive shafts. Proven TRF418 suspension arms and TRF419 rear uprights are employed.